Besides our Pledge Takers there are some more businesses in our city rounding off your green stay in Saskatoon. Whether you are looking to eat, drink, shop or sleep with a clear conscience, we have an eco-friendly option for you. Calories is a nationally recognized award winning bistro that serves organic food, features a knockout wine list, fabulous desserts and a creative local food menu, that changes seasonally. Nourishing Saskatoon for 27 years, Calories has earned its reputation as a place to see and be seen in Saskatoon. At the Night Oven Bakery they grind their own flour to use in their organic breads and baked goods. Even the beverages are all made with fair trade, organic coffee, milk and chocolate. Stock up on imported and domestic cheeses, fresh pasta and sauces, party trays and baskets. Full old-style butcher shop famous for cold smoked steaks, jerky, kabobs and much more. Bulk fresh salads, samosas and spanakopitas available for quick and healthy take-out lunches. BlackFox Distillery is a local distillery with craft spirits they are keen on conservation, sustainability and self-sufficiency which is why they maximize the use of their own products in the production of their spirits. Whenever possible, Steep Hill suppliers are LOCAL producers who offer the best available product. Organic foods (those grown or processed naturally without the use of chemical additives) are given preference over non-organically produced foods. Health Food Store: They carry vitamins, herbs, sport nutrition, natural body care and organic foods. Located on 901 22nd Street West, Moms Nutrition Centre is a health food store, also offering homeopathic remedies. They have certified organic produce, shelves and shelves full of natural and organic groceries, a great supplement section and lots of body care products. Year round farmers' market offering the best in locally produced products. Featuring plants, vegetables, baking, prepared foods, ethnic foods, meats, eggs, honey, crafts and more. Food service available 6 days a week. Centrally located, directly across from the University of Saskatchewan with downtown and Broadway Avenue a short walk away, enjoy the comfort of home with air conditioned rooms, fully equipped kitchens for your use, lounges with cable T.V., wireless internet, free parking, complimentary coffee/tea, breakfast available and a garden patio. An inviting home, conveniently located on a quiet crescent, just off Circle Drive near the Royal University Hospital,the University of Saskatchewan and the Holy Family Cathedral. Enjoy art, books, piano, 50"TVs, air and WiFi. Two rooms on two levels, each with their own private bathroom & private sitting areas. The Mahogany has a queen bed & the bath has a soaker tub, a heat lamp & a low volume flush toilet. The Garden View has a double bed & a sky light in the private bath room. Eco-friendly/chemical free. Heart healthy & gluten/diary free and vegetarian options. Situated in the heart of Saskatoon along the beautiful South Saskatchewan River, the Delta Bessborough is minutes away from downtown shopping, restaurants and attractions. This classic railway hotel is situated on 5 acres of private gardens and offers unsurpassed guest service, exceptional dining options, indoor pool and an onsite spa. Delta Hotels Saskatoon Downtown provides an upscale experience in a convenient downtown location. With 19 floors, the Radisson offers breathtaking views of the South Saskatchewan River and city centre. The hotel offers a wide range of services and amenities, including complimentary Wi-Fi, an on-site fitness centre, a premium restaurant and an indoor water park complete with water slide. Heated underground parking is also available. 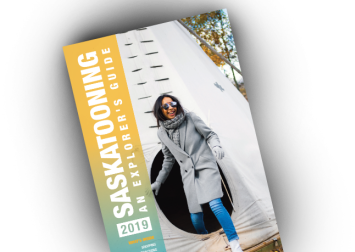 Explore Downtown Saskatoon and Stay Relaxed at the Sheraton Cavalier Saskatoon Hotel ideally situated overlooking the stunning South Saskatchewan River, steps away from the entertainment and business district. Saskatoon's newest, state of the art hotel is ideally located in the heart of Saskatoon's vibrant downtown core with easy access to entertainment, shopping and restaurants. Need a place to relax and be yourself? Join us in Canada's first, Hub at Holiday Inn - Restaurant, Bar and Cafe. Free high speed internet, heated indoor pool and fitness centre, indoor secured parking, meeting space. Whether your travelling to Saskatoon on business or leisure, make the new Holiday Inn Saskatoon your first stop. Please have a look on the Green Key website to find other hotels, which are supporting sustainability in Saskatoon. Saskatchewan's premiere community owned, non profit arts and culture centre - offering a diverse variety of programming, 363 days each year - now with solar panels on the rooftop. The Roxy Theatre is one of only three historic Atmospheric Movie palaces remaining in Canada; originally opened in 1930 and now operated by Magic Lantern Theatres. The Roxy Theatre serves Saskatoon and it's visitors with it's grandly designed Spanish Courtyard-themed main Theatre and lavish decor. For more than 30 years, Meewasin has been a conservation leader in Saskatoon. Conservation projects are designed to maintain a healthy and vibrant river valley including: natural urban parks, canoe launches, interpretive centres, and more than 30 km of paved trails. Cycle, jog, cross-country ski or walk over 21km of riverbank trails through beautifully landscaped parks and natural areas. Outdoor adventure ecotour operator specializing in wilderness canoeing and cross-country skiing programs. Custom designed pre- and post-convention canoe tours available for small groups. Wanuskewin Heritage Park is a National Heritage site which celebrates Metis and Plains First Nations Cultures. Today we celebrate over 6000 years of history on this land, through programs, exhibits, art, cuisine, plus over 6 km of hiking trails. The purpose of The Better Good is to promote a sustainable lifestyle and to provide products that fit that lifestyle. To us, a sustainable lifestyle is one that lets you live your life while caring for the earth, and everything on it. Ten Thousand Villages creates opportunities for artisans in developing countries to earn income by bringing their products and stories to our markets through long-term, fair trading relationships. They envision improved quality of lives of these low income groups of people to encourage and support producers to adopt environment friendly and sustainable production practices. Saskatoon Transit is taking steps to assist in the City of Saskatoon's Corporate Energy and Greenhouse Gas Management Plan by implementing new bio-diesel technologies into the fleet. The conversion of the entire Saskatoon Transit fleet to a 1.0% CME blend will result in a cost reduction through reduced fuel consumption and less engine wear. Did we miss your favourite store? Write us an e-mail and let us know about it!